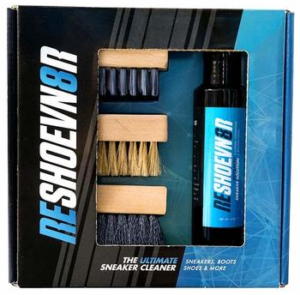 By popular demand we’ve brought in shoe care products by Reshoevn8r to add to our inventory and judging by how sought after their line has become, this one is a keeper! 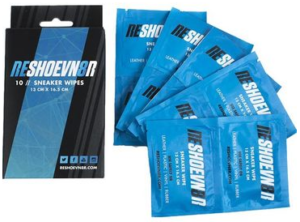 We prepared a run-down of all the Reshoevn8r products now available at MWS just for our blog readers. This kit is a good place to start if you are looking for the essentials. The kit includes a 3 oz. bottle of Advanced Solution, an all purpose brush and a microfiber towel. These pocket-sized, dual-textured wipes can be carried anywhere and will work great on your kicks. Each box contains 10 individually wrapped wipes. 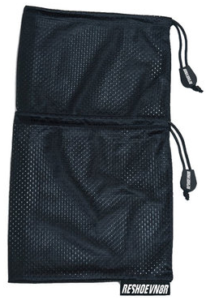 This multi-purpose bag (it can also be used for traveling) is ideal for those who prefer a less “hands-on” method when cleaning their sneakers. Each bag fits either 1 pair of shoes up to men’s size 9/10 or one individual shoe from men’s size 10-17. Please note the bag should be washed before use. What makes this kit special is the range of materials you will be able to clean with its 3 brushes: all-purpose (medium bristle), premium delicate for suede or knit (soft bristle) and sole (stiff bristle). The kit also includes a 4oz of 100% all-natural Advanced Shoe Cleaner/Conditioner. We also sell their amazingly effective solution separately in an 8oz bottle (enough for 80 pairs of shoes!). This eco-friendly solution is made of ingredients such as coconut, jojoba and other natural oils, which will clean and condition all materials. 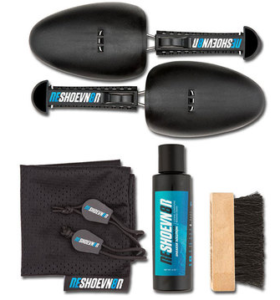 This kit includes an All-Purpose Brush, a 4-ounce bottle of Advanced Shoe Cleaner/Conditioner, a Sneaker Laundry Bag and 1 pair of Adjustable Shoe Trees to help eliminate creasing while maintaining the original form. After all that cleaning, why not add some brand new, cool-looking laces to give your shoes a quick pick me up? 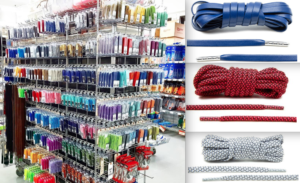 MWS carries the full line of Lace Lab shoelaces in a variety of colors and materials. You are sure to find the right match for whatever shoe you have. We at MWS have everything you need to care for your sneakers, shoes and boots. Shoe lovers out there (who isn’t one? ), you will be amazed when you see our Shoe Care section at our store! 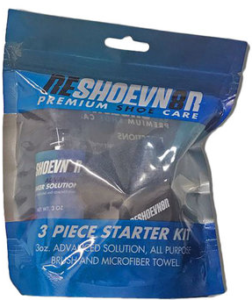 Tagged brushes, cleaning solution, lace lab, reshoevn8r, Shoe Care, shoelaces, shoes, sneaker. Bookmark the permalink.